"My son had a surgery for a liver disease when he was 2 months old. When he gained consciousnesses, the yellowness of his skin went away and he was sitting up and smiling. Little did we know that it wouldn't last for long. His liver is damaged. He was in hospital more than he was at home. He became very weak, by his first birthday he wasn't standing up on his own, he wanted to but he didn't have the energy. It is so painful to see my child suffer so much. If there is anything that I could do to help him, I will do it without any doubt but I feel completely lost. I'm waiting every moment to see a smile his face." - Girish, Father of 1-year-old Ayansh. 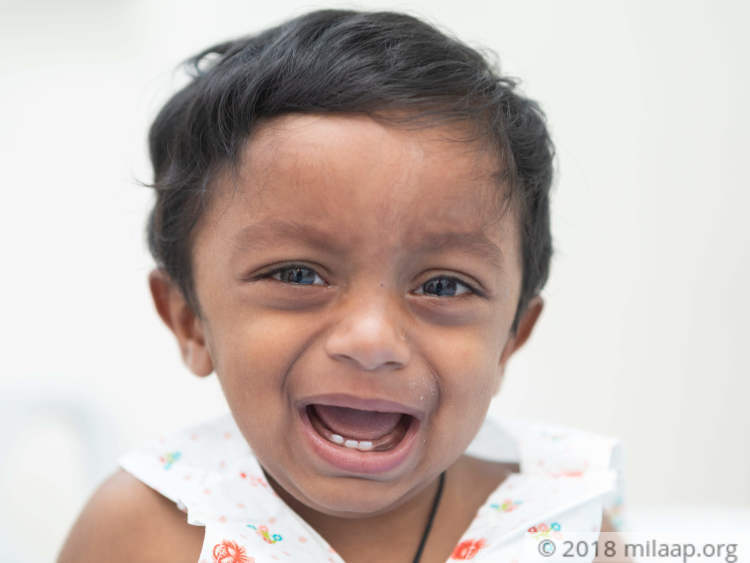 When Baby Ayansh was born, his parents Girish and Madhavi were overwhelmed with joy, and his little sister Sanjana (9) was excited about his arrival. 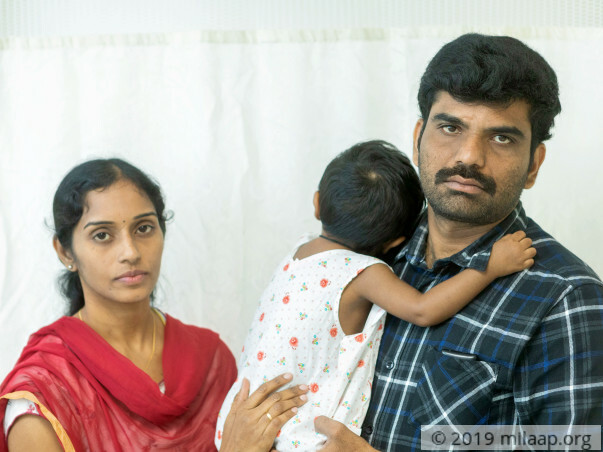 He was rightly named as 'Ayansh' - Gift of God because Madhavi found about her pregnancy only during the 5th month and she had no symptoms till then. When he was born healthy, their joy knew no bounds. Unfortunately, all their happiness was shattered when baby Ayansh fell sick. The yellow tint in his eyes and skin suggested jaundice, a blood test showed high levels of bilirubin, a yellow pigment found in bile. 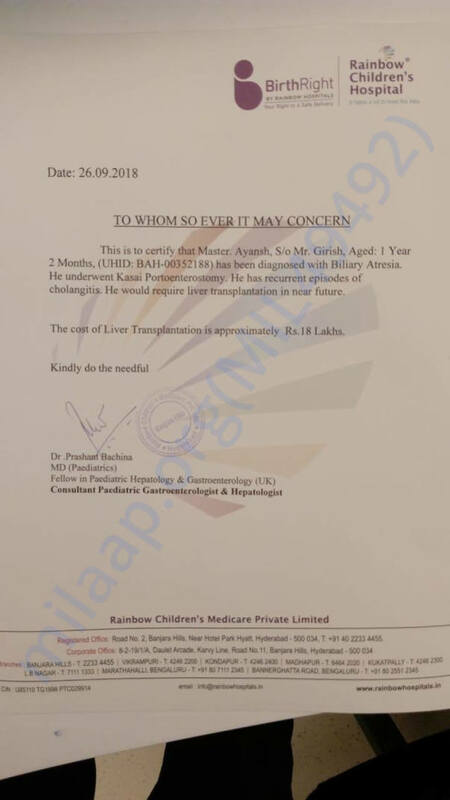 The scan reports revealed that he has Biliary Atresia, it is a liver disease in which number of bile ducts are abnormally low, blocked or absent. The body needs bile to help digestion and carry waste from the liver out of the body. "He was under medications and injections since the diagnosis. His little body is poked with needles everywhere and he is very reluctant to take medicines. 2 months ago, he got high fever and it was accompanied by sever diarrhea. His stomach started to bloat and it is very scary. He cries all the day in pain. I was shattered when doctors told that he has got jaundice again. He never laughs now, there is nothing that I could do to ease his pain." - Madhavi. Doctors recommended placing a stent. The stent is placed inside the bile duct using a small wire, which will open the bile duct that will allow drainage of bile. He was relieved of pain and jaundice only for few days. Unfortunately, he soon fell sick. Doctors told that stent cannot help him anymore and needs an urgent transplant to survive. His father Girish is a matching donor, who is now running back and forth to hospital and to everyone he knew to arrange for money. "We have been running to hospital every now and then. It has been so long since we had a good sleep. My baby is fighting for his life and I live in constant fear of losing him. Doctor told us last year that he can get a transplant only if he gains weight. We did everything possible to help him gain weight, when he gains some weight, very soon a simple fever or diarrhea would make him lose weight drastically. There has been a lot of ups and downs but we were determined to save him at any cost." - Girish. Girish works as a teacher in a private school. Madhavi also worked as a teacher, but quit the job after Ayansh fell sick. They were living a modest life with the meager income and all they wished was to provide their children with education and health. But now they are struggling to save their baby and watching the little one suffer helplessly. "I felt relieved when finally we got a solution for all his pain but the next moment reality hit me. We need 18 lakh for the transplant and it is just beyond my means. So far we have spent more than 7 lakh by taking loans and borrowing from relatives. Now I don't know what I can do. We are already running out of time, with every passing minute his pain becomes unbearable and he cries uncontrollably. He is close to death and I feel helpless." - Girish. 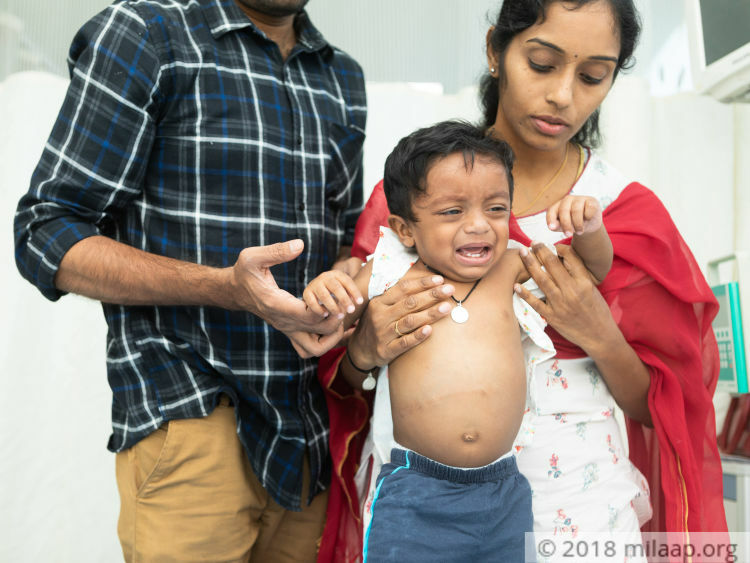 1-year-old Ayansh suffers from severe liver problem and he needs an urgent liver transplant without which he will not survive. 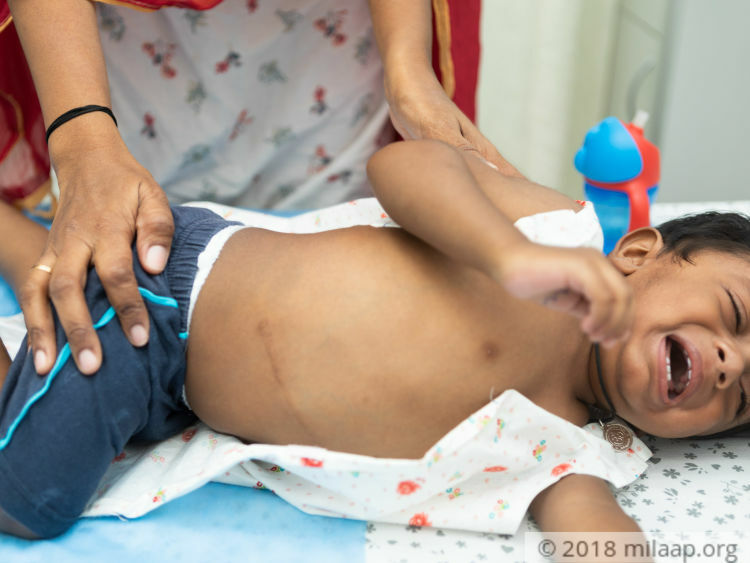 He has been through a lot of pain since birth and his parents are desperately waiting to see him smile. They have spent everything they had for his treatment, now they are left with nothing to save their precious son's life. Only your help can save him. Ayansh underwent the transplant last month and was discharged earlier this month. His father was the donor. Ayansh is doing well and has no side effects to the transplant. 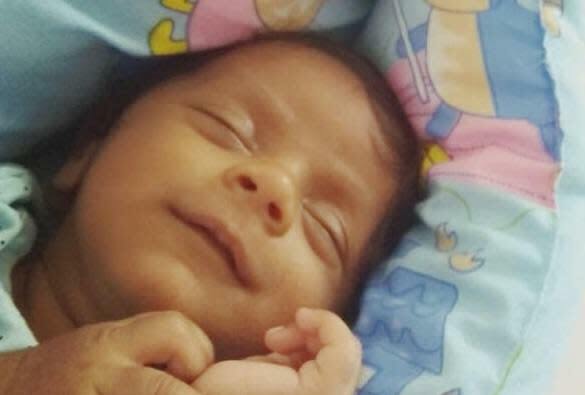 I am overwhelmed by all the love and support you have shown for Ayansh! I am glad to inform the he had no fever for the past two weeks. He only suffers from pale stools which is common as per the doctors. The transplant is mandatory and the doctors plan to go ahead with it by this month. I am thankful for your love and generosity. I request you all to continue sharing the campaign so that we can go ahead with the transplant. Thank you for the generosity shown towards Ayansh! He is doing better now as his fever has subsided. His blood reports are all within the normal range and we hoping to schedule his liver transplant in the coming week. I have been identified as the potential donor. Please pray for a successful surgery and a speedy recovery!